Over the past couple of months, I've been making a couple of changes here at Nourish ME. I've really been attempting to up my blogging game, and create more varied and generally better posts for you guys. Although getting your own domain seems like a fairly menial change, much like creating your own blogger media kit, it can really make a difference if you want to start monetizing your blog. When PRs and brands consider bloggers for collaborative posts, they will often request a certain DA (or domain authority) score. If you still have a blogspot.com or wordpress.org site, or something along those lines, then you don't actually have a DA. Telling them this can come across as unprofessional, and they are likely to therefore look for a blogger who has organised their own domain name. Having said this, I have successfully completed collaborations with brands from my blogspot address, so it by no means totally rules you out. It's also a chance for you to rejig your blog name a little if you wish. My old URL was http://nourishmeclean.blogspot.com because initially my blog was all about clean eating. However, in the past year(!) or so of blogging that's become really irrelevant. So, when I switched to my own domain it became www.nourishmeblog.co.uk. I'm not going to lie, when I first started looking into this I was totally stumped. I didn't know how I was going to set one up - would it involve a lot of tricky coding? Or mess up my Google analytics? Would my old address come up as a 404 and lose me tonnes of pageviews? Don't worry, it was a lot easier than I had imagined, and none of these things *touch wood* has happened in the past month or two that I have had my own domain name. Note: what I'm about to tell you only applies to blogger sites (I really have no idea how I would do it on Wordpress, but I imagine it's not too much more difficult). You will have to buy your own domain name, but there are a whole variety of websites with different prices and packages that you can do this from. I opted to go with Go Daddy because they had an offer on, which gave me a year's worth of my domain name for 99p. On top of the straight up yearly or monthly cost, you can also opt to buy protection. I did this as well and ultimately I think it came to around £8 for the year altogether. You will have to renew it each year, so be warned: buying it does not mean you own your domain forever. Here's where we get a bit technical. Once you've bought your domain and are happy with the name, it's time to actually get it connected to your blog. I was going to attempt to write you guys a step-by-step instruction for this but honestly I don't want to have written something wrong that could potentially destroy your blog! Instead, here is a link to Blogger's own really detailed explanation of exactly how to set your domain name up correctly and with ease. It probably took me about an hour in total - you do have to leave it for 24 hours and then come back to make sure everything is set up correctly. 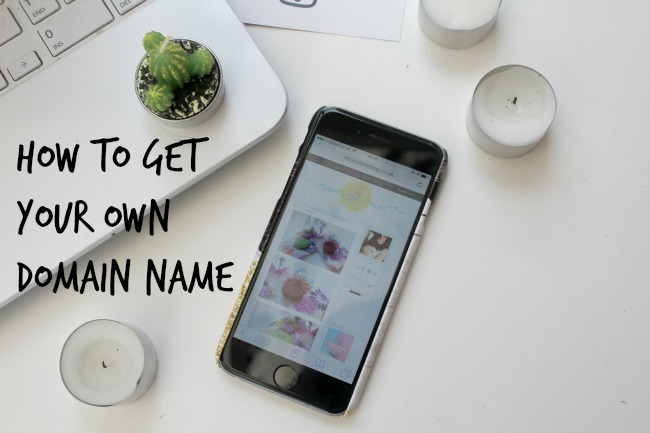 Once you've got your new, sparkling domain name all set up and connected to your blog, you then need to let people know about it! I updated my Instagram, Twitter, Facebook page, Pinterest, Youtube and Bloglovin to show the new URL. However, if people click on your old URL, as long as you've set everything up correctly, it will direct to your new domain anyway! I really hope this was helpful! Great tips, this post would've been so helpful for me a few months back! I've been thinking about updating my domain name for sometime now, but not had the slightest clue how to go about it and was worried I would cause something to go very wrong! I'm so grateful you've shared this post and linked to Blogger's own step by step process too - it all seems a lot less complicated now! Thank you! You're really welcome - let me know if you need any more help/advice! I agree with your post!